evolutionizing the mobile gaming experience for all ages, an Innovative new puzzle game app will change ordinary stacking game play of puzzle theme games. Every one that loves to play simulated puzzle game will definitely enjoy this new app. Regular puzzle gaming apps often brings its players a hard time to finish different stages due to its boring and repetitive game play. This features and setbacks kept mobile gamers to playing on. Rollrollroll is set to give its players a new way to play puzzle blocks. From the regular way of stacking them to each other, Rollrollroll added the rotation system to the classic block piling and fitting that players are so used already. This feature will definitely give them a new way to approach puzzle games. This new puzzle game app is developed by the company Kaleidospace. Kaleidospace make a brand new puzzle game that the gamers have never seen and experienced. After the release of a Flatland: A Romance of Many Dimension during the second quarter of this year. They are planning to make a puzzle adventure game themed application. An application that uses optical illusions of contrast or isometric cubes called Rollrollroll. Rollrollroll brings its players into a rolling and spinning world, experience falling and getting stuck in a hole and disappear. Slipping while crossing, crossing while going, hanging while slipping, overturning while hanging, falling while overturning, flying while falling, a lot of possibilities and exciting thrills is what this game offers. 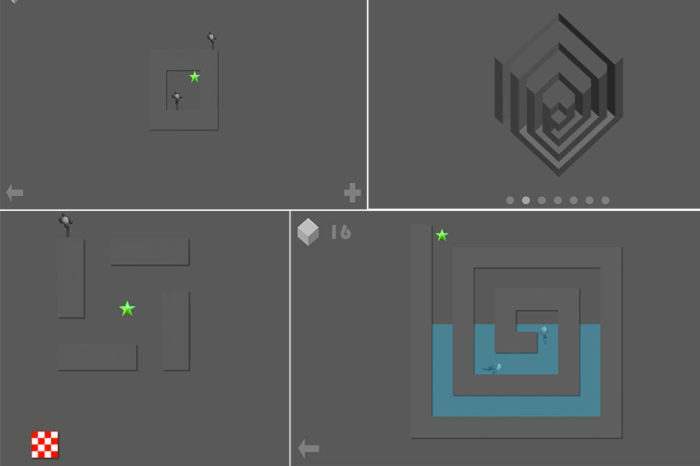 Rollrollroll sets its uniqueness form other games because of it gives the users to challenge physics to help them solve each puzzle levels with the water use play. This game was created with a mindset of adventurous gamers and provides challenging missions to increase its difficulty. Using your fingers, players are able strategically rotate puzzle blocks to fit and advance to the succeeding levels. All gamers are advice to get creative on the way they approach this puzzles if they really want to advance to the next levels. This puzzle game is equipped with seven diverse stages and over a 140 different puzzles. Rollrollroll is also equipped with different new gimmicks and obstacles such as elevator, water, pipes, teleport and many more. This is a simple game to play but gives games a hard time to clear certain levels. The game can be controlled by dragging blocks and rotating them to complete the puzzle. Using of different items will also be available in this game to help you ease the difficulty of the level. You can also command your character to move and jump as well. A zoom in and zoom out feature is also added for players to see and look at the puzzle from either a near or far point of view. This feature also helps gamers to manipulate possible solutions on the puzzle that they are solving. According to the spokesperson for Rollrollroll, this game will not be killing a gamer’s time but it will rather transport the player in to a magical wonderland while the character is going around moving differently from crossing, hanging, sliding, overturning, falling and flying. This game is best applicable to players who want to relieve themselves from stress and spend a great time solving this puzzles. Rollrollroll will be coming to the soon to the app store. The game will be set to be released on the first half of this current year.